Contact Us Your browser does not support the video tag. I suggest you upgrade your browser. Too much of a good thing can become lethal! This is the case of the chlorine that is injected into city water supplies to kill disease-causing pathogens. Any tampering into your control and monitoring systems could dangerously increase water exposure to chlorine and cause a widespread tragedy. In today's interconnected world, your systems have become increasingly vulnerable to unauthorized access through security gaps. Make your operations virtually tamperproof with an end-to-end IoT solution complete with the right network, devices and services. Be confident that all points of entry between your computers, system servers, communications network and the outside world are secure. Limit points of vulnerability and prevent attempts to compromise any part of your systems with: security policy enforcement, authentication, access control, application whitelisting, intrusion detection system, unused port deactivation, TCP/IP connection, data at rest protection and AES 256 encryption. Motorola Solutions' SCADA intelligent edge devices are helping Water and Wastewater utilities drive safer, more secure water production, distribution and usage. Discover how Western United States County overcame a multitude of challenges with the implementation of our advanced SCADA system. Learn how this solution enabled them to communicate over 4,752 square miles of treacherous terrain, securing their water facility and overcoming challenges faced today, making for a brighter tomorrow. In a world where every drop is precious, rely on our Mission Critical Internet of Things solutions so you can operate more effectively and be able to deliver the essential resource the world depends on. 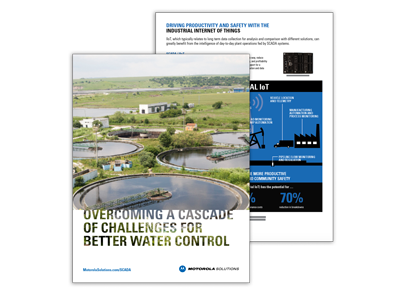 Interested in learning more about Motorola Solutions Water and Wastewater solutions? Contact us to learn how we can help.